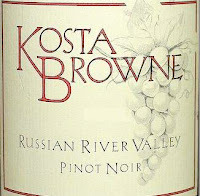 The 2007 Kosta Browne Russian River Pinot Noir is sourced from seven different vineyards located in the central part of the Russian River Valley appellation. Those Seven vineyards are Castaldi, Copain, Nonella, O’Neel, Amber Ridge, Keefer and Koplen. The wine was aged in French oak barrels for 16 months (46% new wood). It's not that often that I get to taste the Pinot's from Kosta Browne because of the high demand and small quantity produced. However, with the economy in a down turn I was easily able to acquire this bottle and just couldn't wait to crack it open to see what it was all about. On the nose I get aromas of deep strawberry preserve, intense cherry, sandalwood, kirsch, cinnamon, brown spice, and a touch of mineral and/or crushed rock. The bouquet is quite tight at the moment but with some aeration it seems to open up a bit and show some of it's layers. I do believe with some bottle age the bouquet will develop positively and be more profoundly nuanced. On the palate the wine shows great intensity of fruit and good purity as well. There are some very nice ripe bing cherry notes that combine with red raspberry, blood orange, toast and perhaps a touch of smoked meat, sassafras, and toasted oak on the finish. The finish is long and extended with those same toasted oak notes that continue to linger. Do you feel that their unbelievable increase in price over the years is warranted & or worth it? Just a few years ago they were about $35-38 & now aren't they somewhere around 60-70? Yeah, not so much. In fact I've tasted better Pinot for $35. Good wine, but way too much hype. Love the Wine, But the new poeple at the winery don't care about their customers anymore!!!!! !